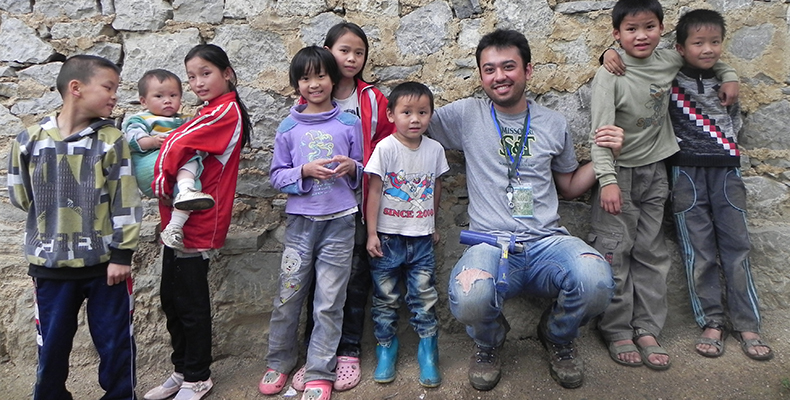 Cagatay Atmaca with local children in Beijing, China. He visited the area as part of a geological field trip in 2012. Photos submitted. A year before coming to Missouri S&T nearly three years ago, Cagatay “Ty” Atmaca was sent to learn English in America by the Turkish Petroleum Corp., the national oil company of the Republic of Turkey. After learning how to navigate the English language and a city like Houston, Atmaca’s transition to life in Rolla was easy. In his job as a student assistant in the international affairs office, he uses his experience to help other international students find homes, adjust to American culture and find their way around town. Atmaca won Best Individual Musical Performance at the 2012 Celebration of Nations. 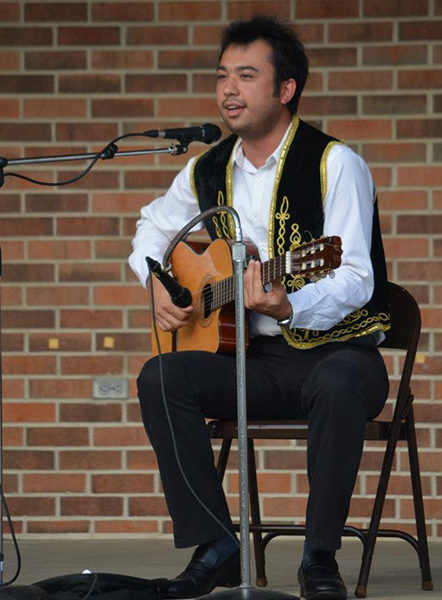 An accomplished singer and guitarist, Atmaca is often asked to perform in the community and at cultural events planned by S&T’s international student organizations. He also plays with Limited Addition, a band he formed recently with Luce Myers, a lecturer in arts, languages and philosophy, Richie Myers, educational program coordinator in international affairs, and Peter Price, who earned his geology and geophysics degree from Missouri S&T in 1977. Atmaca used his musical talents to raise funds for victims of the mining explosion in Turkey and of the typhoon in the Philippines. He also helped raise funds for a Miner Challenge spring break service trip he led with 20 students to Biloxi, Mississippi in 2012, to help with early childhood education at Head Start. That same year he spent four weeks in China doing geological research into the evolution of ancient seas, tropical reefs and life in the Nanpanjiang Basin of Guizhou. He is now working on his thesis “West Waha and Worsham Bayer Fields 3-D Seismic Interpretation,” with his advisor, Dr. Kelly Liu, professor in the geological sciences and engineering department. When he’s not doing working on his thesis or performing, you might find him playing table tennis. 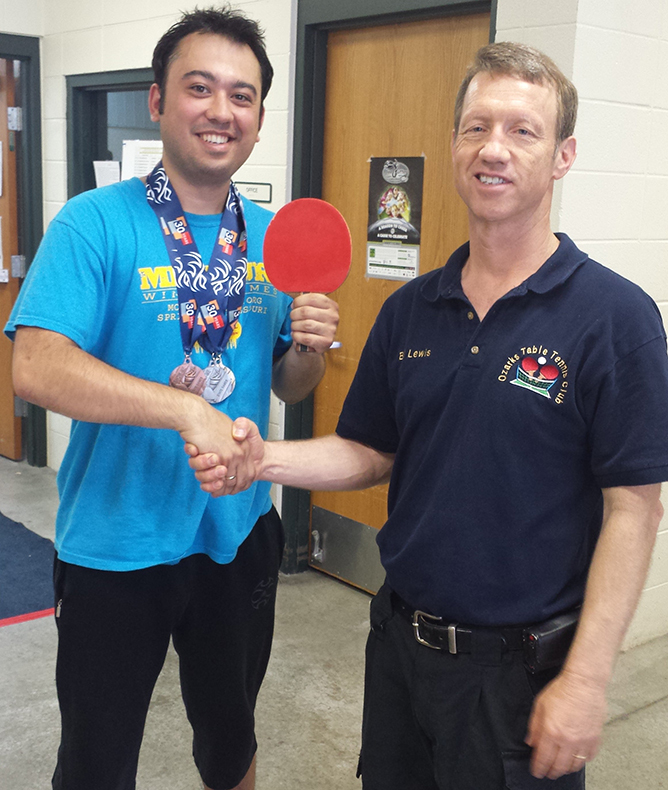 A professional player for more than 10 years, Atmaca won gold, silver and bronze medals at the Missouri Show-Me State Games Open Table Tennis Tournament in June. Atmaca with Bill Lewis, president of the Ozarks Table Tennis Club, after winning gold, silver and bronze medals at the Missouri Show-Me State Games in June. Atmaca is an active member of the Missouri S&T Society of Exploration Geophysicists and the C.L. Dake Geological Society and served as president of the Turkish Student Association for two years. He has been recognized throughout campus for his leadership and service work and received Student Council’s 2013 Diversity Recognition Award. This year he is organizing volunteers for the Celebration of Nations, an international parade and festival that will be held on Sept. 27. He won Best Individual Musical Performance at the festival’s talent show in 2012. Good job Cagatay ! Keep rocking. Great article Linda ! Ty’s contributions have made a HUGE impact on our campus! I and the Department of Student Life are honored to have worked with him so closely. Way to go Ty, keep up the great work! Ty, This is a great article and it is only a part of what you have contributed here on campus and in Rolla. You send good messages of global harmony by example. Shine on! Great article about a great human being! Cagatay, I’m so lucky to have worked with you the last two years! Never have I met someone that continually passes along good will to so many in such an enthusiastic way! Keep paying it forward and best of luck always!!! I really enjoyed reading this article! Ty, it is awesome for to meet a guy like you because it encourages me to follow the best steps that you have been following. I place you in front of me. Keep going bro!